Steve Jobs: The Man Who Thought Different by Karen Blumenthal. Grades 6 and up. Feiwel & Friends, 2012. 310 pages. Review copy provided by publisher for Young Hoosier Book Award consideration. This review reflects only my own opinion, not necessarily the opinion of the committee! Steve Jobs was one of the world's biggest technology innovators and this thoughtful and readable biography brings his story to dazzling life. Starting with his childhood growing up with his adoptive family and losing interest in school early on because he wasn't challenged, this biography illuminates Jobs's indomitable spirit throughout. It doesn't shy away from the rough bits, either. Jobs fathered a child he ignored for many years, at times refused to bathe, and was fired from the company he started because he sometimes had a hard time getting along with people. But there's no questioning that Jobs was able to sense future needs in a way that few have ever done and because of him humans made huge leaps in technology. Ask a class of kids to raise their hand if they have used at least one Apple device in the past week. From computers in schools to iPods to iPhones, Apple is everywhere. Here's a chance for students to learn how it came about. For me, personally, this was an interesting story because I remember so many of these technological milestones playing out as I was growing up. Our first family computer was an Apple II GS. I remember Apple's decline and playing on my friend's family's computer which had Windows 3.1, a distinct change from the floppy disks at my house. It was fascinating to me to read the stories behind these stories and hear about Steve Jobs's part in them. Of course, today's tweens and teens won't have this personal background, but Apple's products are so ubiquitous today that many of them will have some experience with them. Steve Jobs's unconventional path to success will be an inspiration to some. He dropped out of college in his first semester, proving that one can be a success without a degree. The book also clearly shows how very hard he worked to bring about that success. The book is exquisitely researched and back matter contains a time line, an author's note, a bibliography, and source notes. 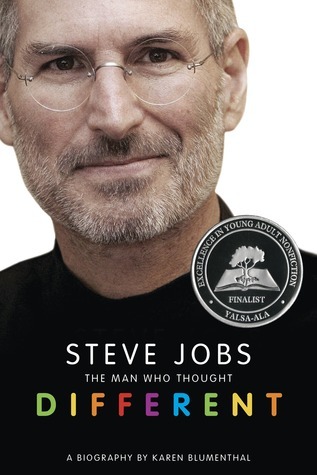 Steve Jobs: The Man Who Thought Different was shortlisted for the Excellence in Nonfiction for Young Adults award. Since Steve Jobs's death in 2011, there have been an influx of biographies about him for young readers, but this one stands above the rest. Make sure you stock your shelves for the tweens who are starting to do reports about his life. Readalikes: For the story of a hardworking man behind another fairly ubiquitous American brand, check out Mr. Sam: How Sam Walton Built WalMart and Became America's Richest Man by Karen Blumenthal. Sam Walton was not a technological innovator, but he was an innovator just the same and he built great success for himself. Steve Jobs: The Man Who Thought Different is on shelves now! Happy Nonfiction Monday!! You can find this week's roundup at NC Teacher Stuff, so go check it out!